Match people with your jobs faster and better than ever before. 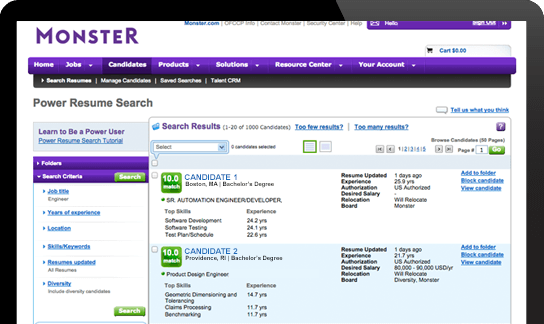 Source and pinpoint the right candidates in Monster’s database with award-winning 6Sense® semantic search technology. What if the only resumes coming across your desk were from qualified candidates? Monster Power Resume Search takes a fundamentally more advanced approach to finding qualified candidates. Source and pinpoint the right candidates in Monster’s database with award-winning 6Sense® semantic search technology. Simply enter your search criteria, and our patented 6Sense® search technology will find matched candidates based on your search criteria. The matches are then ranked according to how relevant and recent the candidates’ qualifications are. There is also seamless integration with Monster’s candidate management tools. It’s about matching and not searching. Our proprietary technology understands concepts and context. A search for “RN” for example will pull up nurses and a search for “attorney” will find lawyers and general counsel. It even understands what skills belong to which job categories, as well as which skills are more advanced than others. As a result, you will have more accurate and better quality matches for your openings. Candidates are then scored and displayed in rank order so you don’t have to spend time sifting through unqualified results. Compare up to five candidates side-by-side to help you make better and more informed hiring decisions. Source and pinpoint the right candidates in Monster’s database with our award winning semantic search technology. Take 7-days to search and view up to 100 resumes. Only $420. Limited time offer.